In reading this book I have gained a better understanding and more importantly, an acceptance of myself. I have known that God works through us in our weaknesses but what if that weakness is a chronic one. How can we live and even understand when pain and disability is long term? 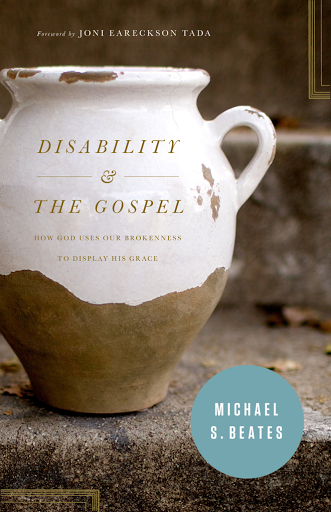 What we can learn from the disabled is that they are a reminder to us that we are very broken in a lot of ways ourselves. Beates suggested that it is for that very reason that we tend to avoid or ignore those we see in wheelchairs or are blind or deaf. We choose ignore them as a denial of the brokenness in ourselves. Or we ask the questions--what happened and how it happened--not to offer any useful concern, but to subconsciously question our very own rejection of our own flaws in being mere human. I challenge you the next time you feel a need to ask how and why a person is the way they are, to think again your motive of asking, and maybe refrain from doing so. They are struggling already without having you to ask. They will share with you when they are ready. Beates said, "Did you hear the critical phrase? 'God has more need [not that he has any need at all, of course] of our weakness than of our strength' (quoting Marva Dawn). Such a concept is completely foreign to all that the world understands and pursues. And one telling measure of the world’s encroachment into the church is how foreign this truth also seems to many Christians—leaders and lay people alike." When I read that, the question I had was, how can one apply this paradox, if I can call it that, at work, in organizations where expectations are high, improvements demanded for and achievement vital for survival? I feel that we at profit making corporations should not look down on workers who are struggling at work but to recognize that we all struggle and we all need to find our space to come to terms with about who we are and who we are not, what we can and what we cannot do, so that we can all excel at what we are good at. But sadly, that is not evident in corporations. The inevitable and reality of human frailty is always rejected, cut off, terminated. Don't we sometimes find it so tiring having to always prove ourselves at work, when we have so little to offer in areas where we know we struggle? It is in Christ that we know our place, weak and in need. And unless and until we admit to our brokenness and our need to submit to Him, we will remain in our delusion of wholeness and achievement.